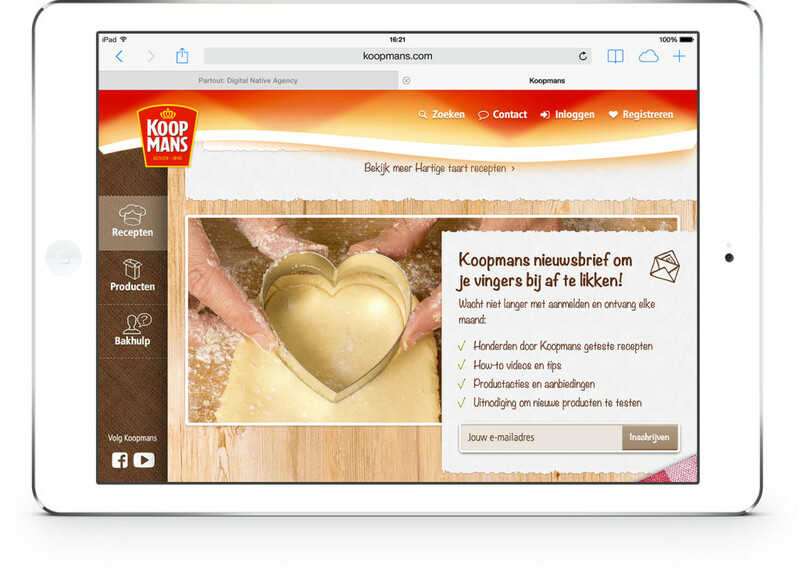 Since 1846, Koopmans is the baking specialist of the Netherlands. They inspire home bakers with new recipes and sell very easy to use products. Koopmans asked Partout d.n.a. 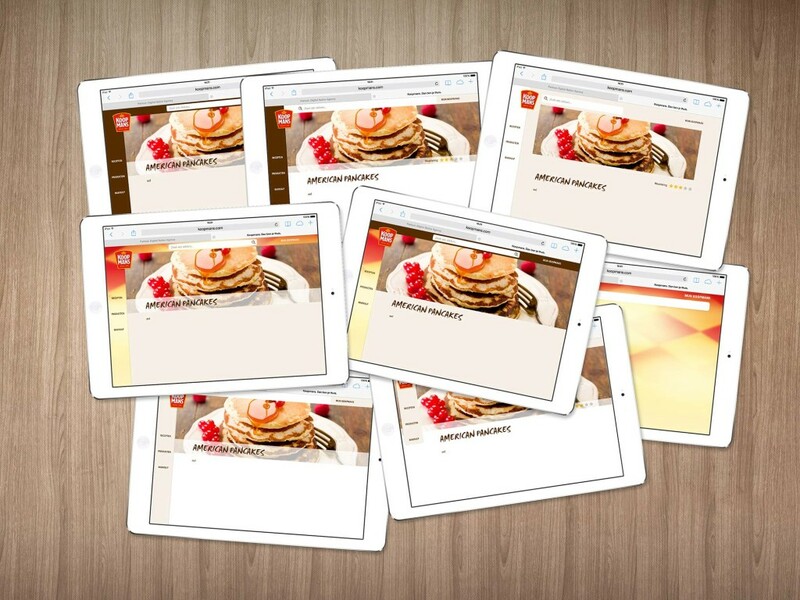 to create a corporate website that inspires and helps home bakers. The result is a rich online experience that really sets the mood for baking. For the design we used warm colors to set that ‘home’ look and feel. The wooden pattern on the background resembles a kitchen table, on which all the pieces are spread. The lay-out is very playful and the website inspires the user with new recipes and convenient tips and tricks. 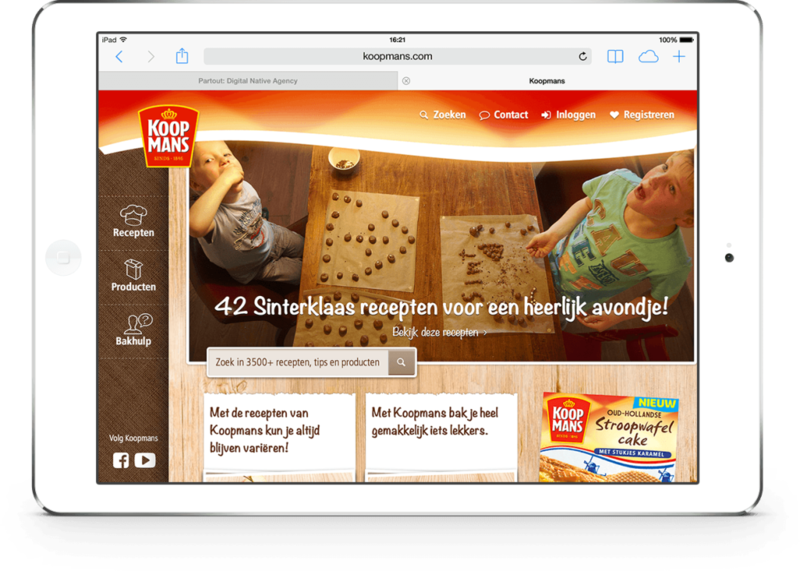 Together with Koopmans we started a couple of sessions to determine the look and feel of the website. 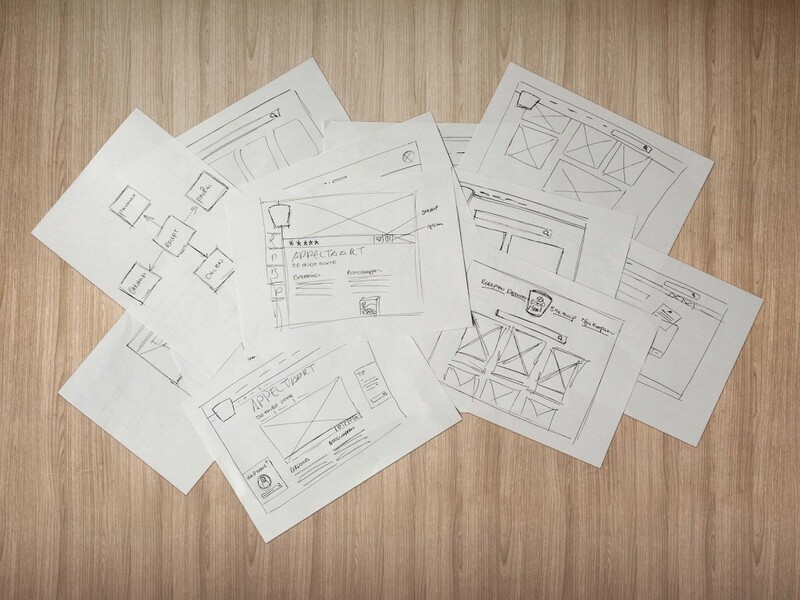 Next to that we started sketching our ideas for the user interface. In this phase we mainly thought about the placement of the menu, logo and the size of the recipe photo. We really wanted to make the recipe page as inspiring as possible. We noticed from the current statistics that the recipes are the most visited pages. Users are most likely looking for recipes and we really wanted to make it clear for them how to make a recipe. 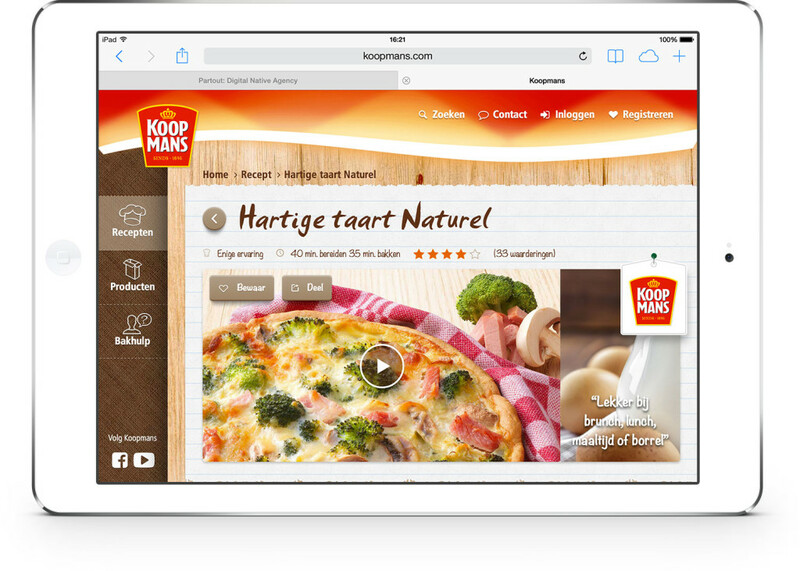 Because with Koopmans, it always works. You only get one chance to make a first good impression, so we made the core information of the recipe as clear and understanding as possible. Users mostly judge a recipe by a few things: recipe image (end result), rating, baking level, baking time, baking requisites and the baking steps. We’ve put this information at the top so a user can decide right away if this is what they were looking for. The recipe page really tells a story. About its heritage, about its ingredients, about all the things you need to make it work. We translated this by using props that fits the core product (like apples, cinnamon and raisins for apple pie) to make the content more alive and vibrant. 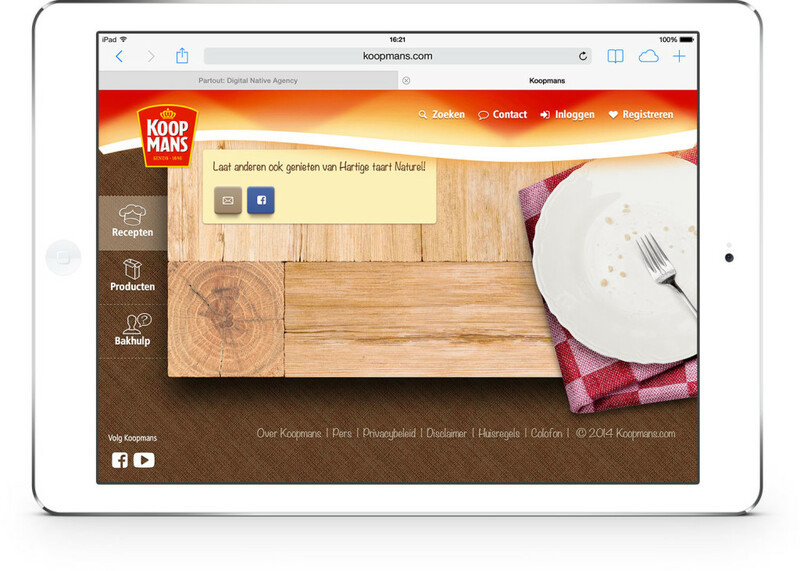 We even added a little gimmick: at the end of the page you see a plate with a fork and some crumbs. Hmm.. that was a tasty apple pie! The tablet is getting more populair in the kitchen and when baking it’s important to do every step with precision. You don’t need all that fuzz around. That’s why we’ve created the step by step baking mode. 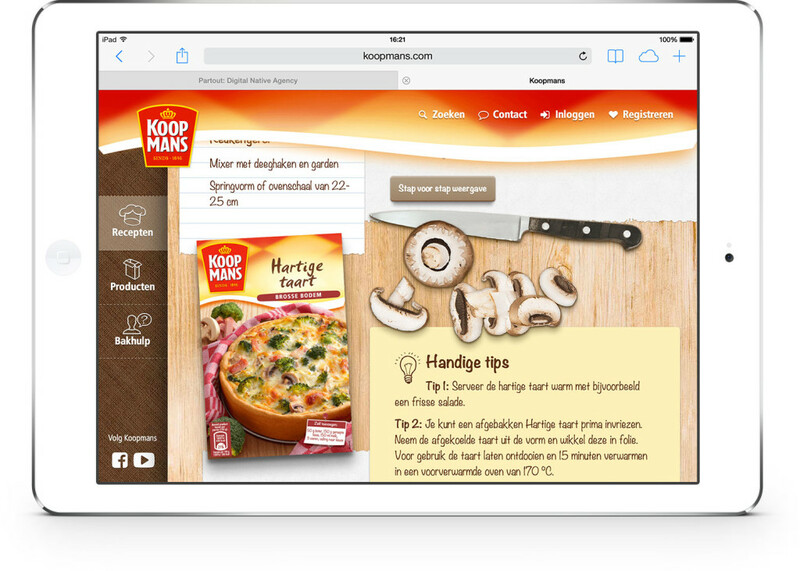 The user can activate the step by step mode on a recipe page (if available). It shows all the baking steps one step at a time. Ready for the next step? Just swipe! Nothing is more frustrating if you can’t find what you’re looking for. 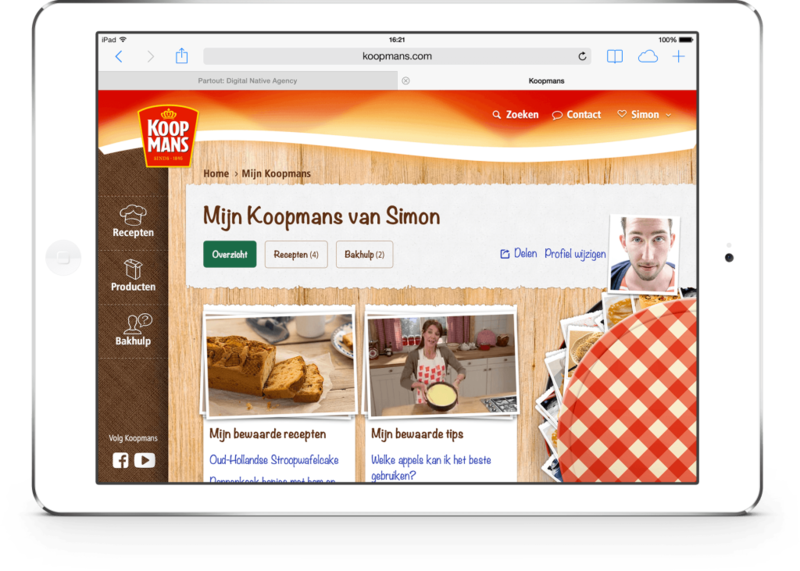 We made saving and viewing favorite recipes of the user really accessible by introducing ‘Mijn Koopmans’ (My Koopmans). 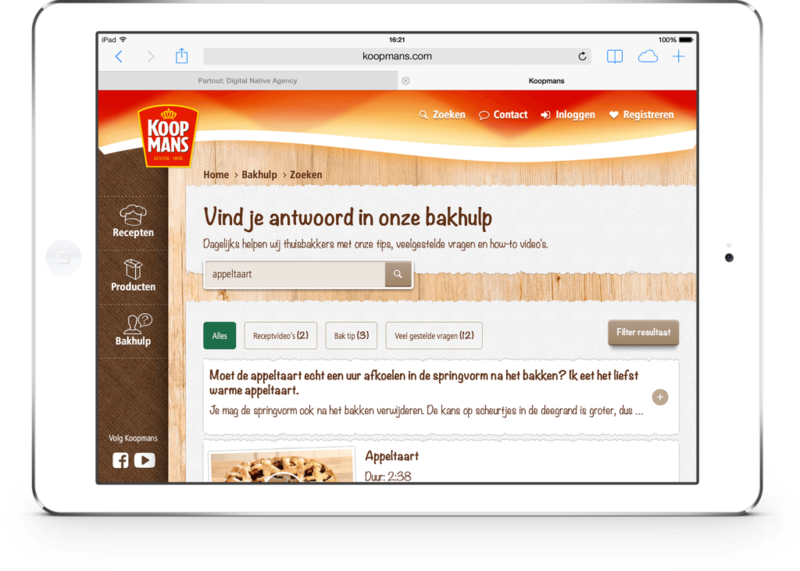 When you’re logged in to your Koopmans, you get a quick overview of all the recipes you’ve saved. We used a typical Dutch cookie jar as a metaphor. Because in the old days people would save their favorite recipes in their cookie jar. But that’s not all: you can also save baking tips, video’s and FAQ’s if you need that little bit of extra help. Imagine you’re baking a pie. Your hands are covered with all sorts of ingredients, you’re kind of rushed because you haven’t got that much time and you want to do it right. Koopmans understands the situation of home baker like no other. We’ve put up service as a key element of the website. We introduced a new and improved baking help that lets the user find the answer they need before, during or after baking in just a few clicks. The baking help is a sort of reservoir with all the information the user needs: tips, video’s and frequently asked questions.